백자상감투각모란문병은 조선시대 전기에 제작된 상감장식이 있는 병으로 당시 백자병의 전형적인 형태와 장식소재, 유약의 색깔, 굽의 특징 등을 갖추고 있다. 특히 전형적이면서도 당당하고 우아한 형태와 독특한 이중의 제작기법, 투각과 상감기법을 혼용한 특이한 장식기법은 현재까지 알려진 예가 없는 희귀한 사례이다. 이 병은 주둥이가 나팔처럼 벌어져 있고 목은 가늘고 길며, 몸체는 저부에서 펑퍼짐하게 벌어진 형태이다. 굽의 높이가 비교적 높고 크기도 큰 편으로 조선시대 전기에 제작된 백자병의 특징이 잘 나타난다. 투각이 된 바깥 면과 그 안쪽에 실제로 내용물을 담는 작은 병을 따로 제작한 것으로, 현재까지 알려져 있는 백자상감병과 확연히 구분되는 독특한 작품이다. As one made in the early Joseon Period (1392-1910), this object displays the shape, ornamental factors, glaze color, and style of the bottom typical of white porcelain bottles made during the period. In particular, the imposing yet graceful shape and the unique ornamentation technique using openwork and carving in relief are a rare example, and little is known about the likes of such. The mouth of the bottle extends outward, like that of a trumpet. The neck is thin and long, and the lower part of the body is wider than the upper part. 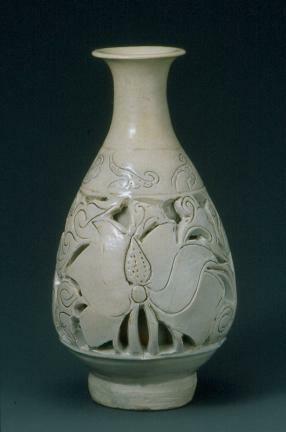 The bottom is relatively high and large, which is characteristic of the white porcelain bottles made in the early Joseon Period. The outer surface showing bratticing is separated from the inner space for containing liquid. It is a unique object distinguished from its cousins made in Korea.